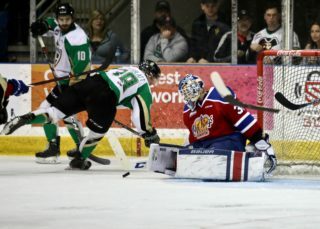 Calgary, AB – The Prince Albert Raiders (44-7-0-2) rolled to an 8-2 victory over Calgary Hitmen (27-20-4-1), rebranded as the Calgary Wranglers for the night, on Friday night at the Stampede Corral. It was the final game of the Hitmen’s Corral Series Presented By Adrenalin Source. The Hitmen suited up as the Wranglers for the evening, while the Raiders donned throwback sweaters from the 1988-89 season. Cole Fonstad led the Raiders on the scoresheet with a pair of goals and three assists on the night. Noah Gregor netted his second career WHL hat trick and chipped in an assist. Dante Hannoun had a goal and an assist, while captain Brayden Pachal picked up a pair of helpers. 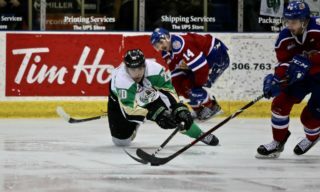 Sergei Sapego and Eric Pearce also scored for the Raiders. 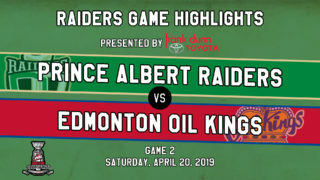 The win gave the Raiders a season sweep of the four-game series against the Hitmen. 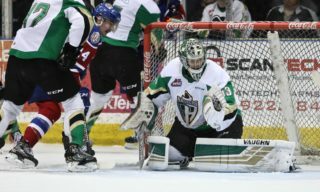 It was the first time in team history that the Raiders swept the Hitmen in the season series. The Raiders got the scoring started on the power play. After Devan Klassen was sent off for tripping, Mark Kastelic put the puck out of play to give the Raiders a two-man advantage. A minute after Kastelic’s penalty, Dante Hannoun’s shot from the point beat Jack McNaughton to put the Raiders up 1-0 with his 25th goal of the lead. A minute later, the Raiders doubled their lead. Five seconds after Kastelic’s penalty expired, Aliaksei Protas hit Fonstad with a cross-crease pass and the Montreal Canadiens prospects tallied his first goal of the game at the 8:37 mark. Just 20 seconds later, a scary moment ended McNaughton’s night. Calgary’s goaltender attempted to beat Brett Leason to a puck at the faceoff circle. The two players collided, resulting in McNaughton staying down on the ice. He was helped off the ice by his teammates. At the 3:12 mark of the second, the Raiders extended their lead. Fonstad worked around the Hitmen’s end before spotting Gregor in front of the goal. The San Jose Sharks prospect wired a shot past Carl Stankowski to make it 3-0. Twenty-one seconds later, the Raiders upped the lead to four. Parker Kelly broke down the right wing and sent a pass to Sergei Sapego who one-timed it past McNaughton for his eighth goal of the year. Before the end of the second, the Hitmen cut into the lead. James Malm put a shot on goal that was turned aside by Ian Scott. However, Riley Stotts was at the top of the crease and he banged home the rebound to make it 4-1 after two periods. In the third, Fonstad’s second of the night restored the Raiders’ four-goal lead. The Estevan product attempted a centering pass, but the puck deflected off the stick of a Hitmen in front of the net and past Stankowski for his 24th of the year. Fifteen seconds later, the Raiders struck again. Jakob Brook put a shot on goal that was stopped by Stankowski. The rebound feel to Pearce who snapped it past the sprawling Hitmen goaltender for his fifth of the year. Gregor then scored back-to-back goals five minutes apart to register his hat trick. He tallied his 32nd goal of the year when he chipped a puck past Jackson Van De Leest and lifted a shot over Stankowski. His third of the game came after Ozzy Wiesblatt spun away from his defender and set Gregor up with a one-timer for his 33rd. Late in third, Malm got behind the Raiders’ defence and was brought down by Max Martin. The Hitmen forward was given a penalty shot and he beat Scott to wrap up the scoring with 2:57 to play. Scott made 21 saves to earn his 31st victory of the year. Stankowski stopped 32 shots in relief and was saddled with the loss. 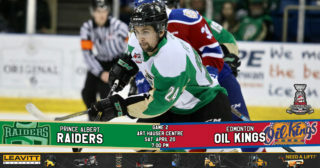 The Raiders wrap up their Alberta road trip on Saturday night at the ENMAX Centre against the Lethbridge Hurricanes (27-15-5-5). Game time is 8 p.m. CST. Head to The Rock and Iron Sports Bar to watch the game or listen to Trevor Redden on 900 CKBI. 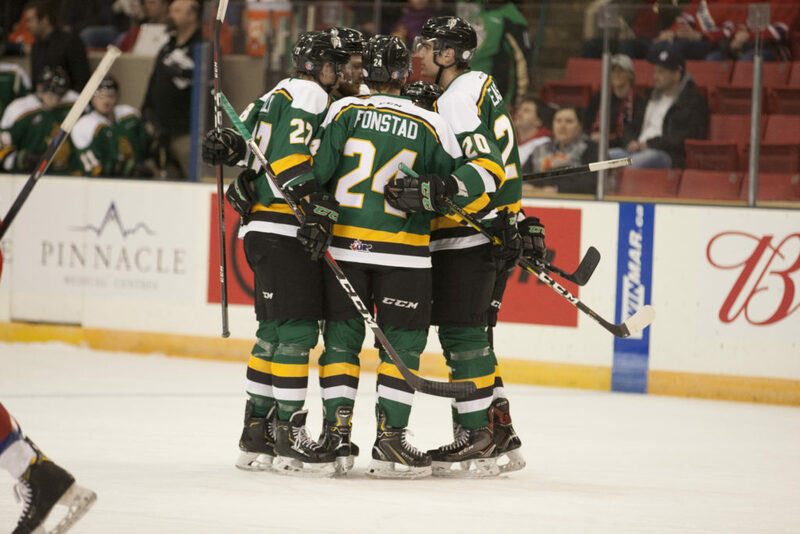 The next Raiders’ home game is Friday, February 15 against the Brandon Wheat Kings where the Raiders will once again be wearing their 1988-89 throwback sweaters. Puck drop 7 p.m. Tickets are available at raiderhockey.com and the Raider Office.